Our Nottawasaga Model Railway Club (NMR) takes its modular HO scale layout to train shows in our geograhpical region of Central Ontario. Instead of only running trains in a circle as most do at model train shows, we take a "hands on" approach to model railroad operations. We encourage youngsters (and adults) to try their hand at running the model trains. Club members act as instructors. We give the kids a signed certificate making them official model engineers on the NMRC layout. We learned through experience that we had to have a fixed cycle of moves to simplify the switchlist operations. Even though we attend half a dozen shows a year we don't get bored. Although the number of trains is fixed and we use a 4-cycle schedule similar to 4-cycle car cards, it's difficult to remember from day-to-day and month-to-month what car went where. The cars are put onto the layout at the exact same starting point each weekend at the show. Over the course of two days we seldom complete all four cycles because we need to take time to explain to new operators what they have to do. There's sufficient down time to permit a leisurely pace to the model railroad operations at any show. 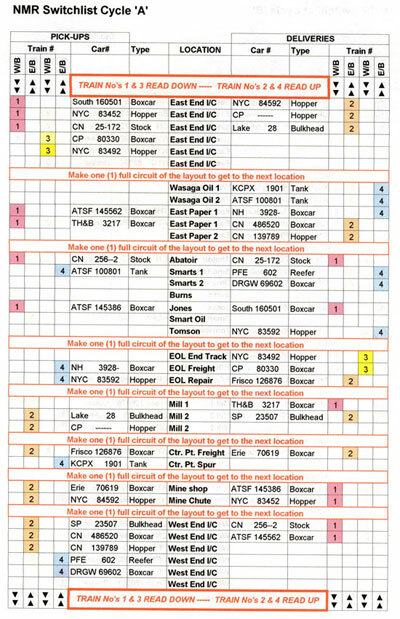 We used a slightly expanded switchlist and train schedule at the club where we had additional modules and more freight cars and industries. This was before our move to new premises at Bygone Days in Collingwood where we're building a replica of the Barrie to Meaford CN line in the 1950s. Model railroad operations have not been worked out for that permanent layout. Passenger operations were more casual. It depended what members brought to the club or show. The passenger trains simply complicated the operations because we had "to clear the main" to let them through. On my HO scale Utopia Northern we used the typical 4-car rotation with Micromark car-cards. 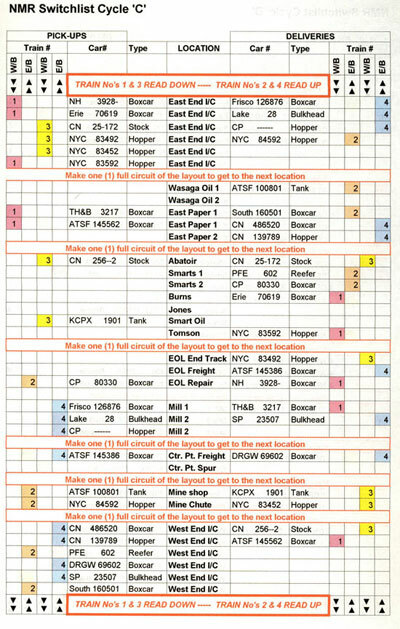 The cycle information on the cards does not change, but cars of a similar type can be substituted for variety between cycles. As we usually only had two to four operators we found it took up to two months to complete all four rotations. The weekly model railroad operations on the Utopia Northern ran 3 to 3 1/2 hours. It's hard to remember where the specific cars have been from week-to-week. We threw in some extra through freights and passenger trains where the consists didn't change. Because cars were not switched out in these trains we could use whatever was left on the shelves. We also had some added rules to complicate the operations such as insisting that steam engines be turned at the end of their runs and clearances restricted movement on some tracks. For example, a van's cupola was too high to clear the door at 5-Star Manufacturing and that track was often used to make up a freight to leave North Point (See my previous Utopia Northern RR). 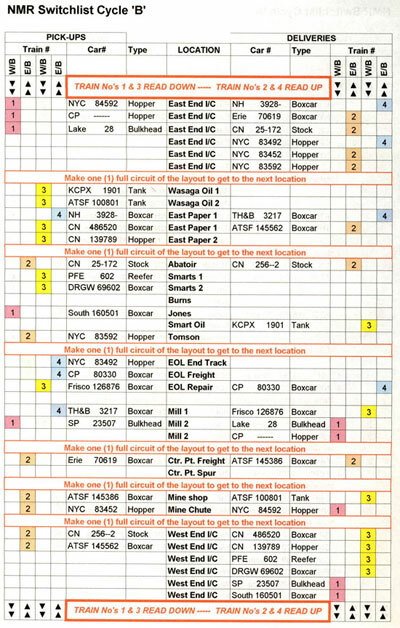 On my new UNRR I intend to use jmri computer-generated switch lists as we have been doing on John Houghton's N scale layout. If you haven't tried model railroad operations, the "fixed cycle" method is a good way to learn about it in a more controlled environment. 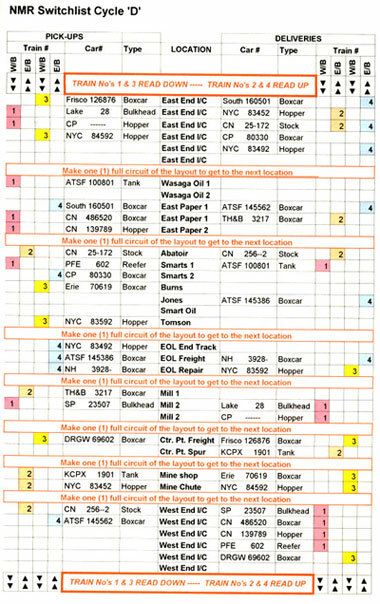 It really works at the train shows because our members have a "cheat sheet" to keep track of where they are while talking to visitors and inexperienced operators. This will give you a good idea of what operations on an HO layout can be like. There were 15 of us so it was organized mayhem while we got things underway. Don't pass up the chance to participate in an ops session if you have the opportunity. It's lots of fun. Go from "model-railroad-operations" to JMRI Operations Software. Return from "model-railroad-operations" to my Home Page.